If you're in the market for an Apple laptop, you can go for the cheaper, rather dated MacBook Air, or you can make a wiser choice and opt for a MacBook or MacBook Pro – both these lines have their pros and cons, which we're going to lay out for you here in our MacBook vs MacBook Pro guide. 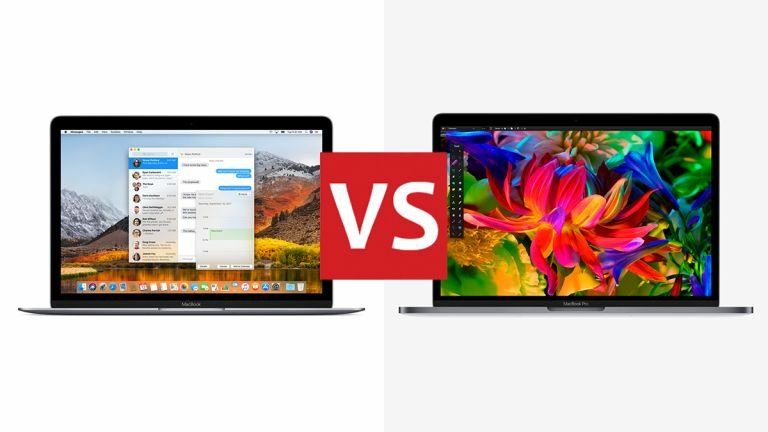 You've got a choice of different configurations whichever laptop you go for, but the overall the MacBook is the cheaper, less powerful choice. However we'll compare the two ranges in all the areas that matter to help you make the right pick for your needs and budget. We're looking at two very thin, very light laptops here, but the smaller 12-inch MacBook is really, really thin and light – it tips the scales at just 0.9 kg (1.98 lbs) and is a mere 13.1 mm (0.52 inches) thick. The 13-inch and 15-inch MacBook Pros, meanwhile, weigh in at 1.37 kg (3.02 lbs) and 1.83 kg (4.03 lbs), and are 14.9 mm (0.59 inches) and 15.5 mm (0.61 inches) thick respectively. Apple's design chops are in evidence across both these laptop ranges, with curves and lines in all the right places, and you certainly wouldn't be embarrassed to pull out either the MacBook or the MacBook Pro at your local coffee shop. Both feature crisp and clear displays with little in the way of bezels. The MacBook Pro computers are bigger all round, especially the 15-inch model, so you do lose some of the portability. The recently invented Touch Bar sits above the keyboard on all the 15-inch Pro laptop configurations and most of the 13-inch configurations, so if you think you'll make use of it, that's something to bear in mind. The internal specs represent the biggest differences between these two laptop lines, and you're going to get more oomph for your programs and processes with the MacBook Pro. The MacBook comes with either a 1.2GHz dual-core 7th-generation Intel Core m3 processor or a 1.3GHz dual-core 7th-generation Intel Core i5 processor, while the MacBook Pros start at a 2.3GHz i5 and go up from there. You can get a MacBook Pro with a 2.2GHz quad-core Intel Core i7, if you've got the cash. The MacBook and the 13-inch MacBook Pro come with 8GB of RAM, while the 15-inch MacBook ups that to 16GB. 256GB or 512GB of storage is available on both lines, with the 13-inch MacBook Pro also offering 128GB as an option. Then there's on-board graphics – the integrated Intel GPUs are superior on the MacBook Pro, with the option of a Radeon Pro card on the 15-inch Pro laptops. If you want to be doing some serious image and video editing, the extra graphics horsepower on the MacBook Pros will really come in handy, though the MacBook will of course be fine with most everyday tasks, from web browsing to movie watching. With the exception of the Touch Bar, which we've already mentioned, the features are very similar across the board on all of these laptop models. One reason you might opt for a laptop with a Touch Bar is that it comes with Touch ID built in, so you can unlock your laptop with the touch of a finger. All the MacBook and MacBook Pro configurations run macOS High Sierra, so you've got access to all of Apple's latest apps, and the Siri digital assistant if and when you need it. You do get up to four Thunderbolt/USB-C ports plus a headphone jack with the MacBook Pro option – when it comes to the MacBook, you have to make do with a single USB-C port, plus a headphone jack. The MacBook Pro machines are basically just more of everything, with some under-the-hood improvements over the MacBook that you might not immediately notice: better built-in audio, for example, faster SSD read and write times, and higher maximum brightness levels on the display. You've also got a wider choice of configurations, so more flexibility in terms of getting the exact device you want. Speaking of configurations, Apple is selling two variations of the MacBook through its store at the moment. The cheapest is £1,249/$1,299 or you can bump the specs up a little and go for the £1,549/$1,599 version instead. Both of those models are available in your choice of space grey, gold, rose gold and silver colours. Over on the MacBook Pro side of the fence, you've got a choice of 13-inch and 15-inch models, plus plenty of variation within those two categories. The smaller models start at £1,249/$1,299, just like the MacBook, and go all the way up to £1,949/$1,999; the larger models start at £1,899/$1,999 and top out at £2,699/$2,799. For the MacBook Pros the only colour options you've got at space grey and silver. Down at the lower end then the prices are actually pretty similar – it's just a question of whether you want the more powerful internal components or the greater portability (thinness and lightness). Obviously up at the top-end of the 15-inch MacBook line, you're going to need a rather substantial budget to do any shopping here. Both these Apple laptops are stylish, speedy, and run the same macOS High Sierra software. Your choice really comes down to whether you want the improved performance of the Pro line or would rather have something smaller and lighter that's easier to throw in a bag when you're on the move. Every laptop hits a compromise between performance and portability, and these two laptop lines show it. The MacBook is the older of the two ranges, so bear in mind that Apple might refresh it in the not-too-distant future. It did get a few spec bumps in April 2016 but there hasn't been much movement on it since then, so an update could be on the cards, even if it's just a few internal upgrades. This is the laptop to get if you want something easy to carry around and don't do much in the way of intensive video and graphics editing. The MacBook Pro isn't particularly new either though – Apple launched this range of computers back in October 2016, so it's possible we'll see some kind of upgrade later on in 2018. If you need raw performance, or extra ports, or want a bigger display to see your websites and spreadsheets and movies on, then the MacBook Pro is the one to opt for.